1 of 3 Heat 1 tbsp of the olive oil in a large Dutch oven over medium-high heat. Season chicken with 1/2 tsp of the salt and 1/8 tsp of the black pepper. Cook skinned side down 5 minutes; turn and cook 3 minutes. Remove to a plate. 2 of 3 Add remaining 1 tbsp olive oil; stir in onion, peppers and garlic. Cook 5 minutes, stirring occasionally. Add mushrooms and tomato paste; cook 3 minutes. Stir in broth and tomatoes, scraping any browned bits from bottom of pan. Bring to a boil and simmer, with lid ajar, 10 minutes. 3 of 3 Stir in remaining 1 tsp salt, remaining 1/8 tsp black pepper and the oregano and thyme. Place chicken pieces into sauce and add any accumulated juices from plate. Simmer, with lid ajar, 15 minutes. Stir in basil leaves. 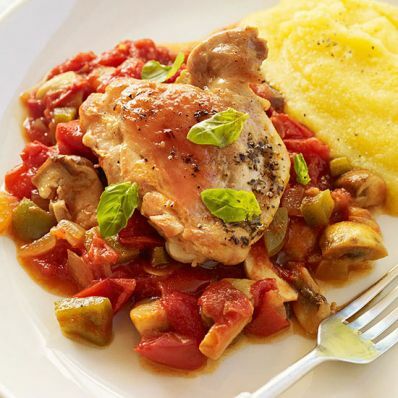 Serve with polenta, if desired. Per Serving: 1128 mg sodium, 4 g fiber, 60 g pro., 2 g sat. fat, 16 g carb., 8 g Fat, total, 140 mg chol., 382 kcal cal.